Stunning contemporary silver and gold bangle, hand-made in our workshop in the Garden of England. 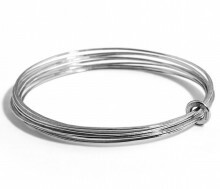 Evoking rain falling on water, this stunning hand-forged, ripple-effect bangle is made from a continuous coiled length of beaten silver, giving the effect of many fine bangles bound by precious 18ct gold ring. With a shiny hammered finish on one side and a soft satin finish on the other, wear it whichever way you like best. 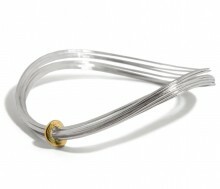 This Modern piece of British hallmarked silver and gold is unique to Latham and Neve. Wear it for special events, or for everyday; it's adaptable and versatile, and made to be worn! Sterling Silver and 18ct gold. 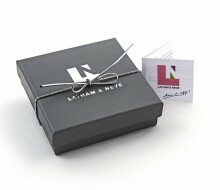 The bangle is presented in a stylish gift box exclusive to Latham & Neve and ready to be given. Or just kept.